Revered for its many village deities as the ‘Land of Gods’ (Devtas), Kullu – spread out on the banks of River Beas is a quiet town that attracts travellers, connoisseurs, photographers, filmmakers and honeymooners round the year. As a gateway to the popular destination of Manali, it is a cool escapade for tired souls. Founded as a capital of Kullu in the year 1660, today the sprawling township serves as the administrative headquarter of the valley district. The intricate web of valleys, deep forests, gushing streams and rivers, bountiful orchards and the forbidden heights of the Greater Himalayas for a magnificent backdrop, is a sight to behold. Myths and legends enrich the deeply religious beliefs of a simple people that can be seen during a variety of festivals celebrated in the valley. In October, the quiet town comes to life when the week-long Kullu Dussehra festival is held. A congregation of Devtas – village deities carried on palanquins, grace the occasion to celebrate the victory of good over evil. Language: Hindi, English, Punjabi are spoken and understood by those engaged in tourism. Locals speak Pahari. Clothing essentials: Tourists are advised to carry cotton clothing in summer, light woollen in spring and autumn and heavy woollen in winter. By Air: The Kullu-Manali airport is at Bhuntar, about 10 km from the main town. Flights to and from Delhi and Chandigarh are available. By Rail: From Chandigarh or Kiratpur broad gauge train stations, Kullu has to be reached by a road journey. However, from Pathankot station there is a connecting narrow gauge rail track to Joginder Nagar from where Kullu can only be reached by road. By Road: Kullu is well connected by road. Luxury and ordinary coaches regularly ply between Delhi-Chandigarh-Shimla-Dharamshala and Kullu. For those willing to explore, Kullu offers a romantic and rejuvenating holiday filled with delightful adventures. Board a raft and set out on a white water rafting thrill in River Beas, trek to the alpine pastures of Tirath, make a sporting catch of trout fish by testing your angling skills at Banjar or just enjoy the serenity of camping at Raison. Whatever your choose, Kullu will always charm you. Riding the rapids in a floater on River Beas makes for the thrilling sport of white water rafting. In Kullu the adventure is conducted by experienced rafters, which can be experienced on long river stretches from March and May and from September to November. Tucked away to the north of Kullu are a cluster of small villages that offer excellent camping sites by the bank of River Beas. Amidst apple, peach or plum orchards, spending a night or two in camp at Raison is coming back healed by nature. From near the camping meadows some exciting white water rafting expeditions are also conducted. Walking uphill to Bijli Mahadev temple offers some very commanding views of Kullu valley. In the temple’s courtyard there is a pillar shaped Shiva Linga that is plastered together with butter. Every year frequent lightning strikes shatters this pillar. The pieces of this pillar are put together by the priests with butter to resurrect the Shiva Linga again. Known as Sultanpur Palace, this residence of the erstwhile royal family of Kullu is just a stone’s throw away from the main town. Built in the traditional hill architecture style, the building exhibits fine artistry in its wood carved interiors and exteriors. The palace walls are adorned with a great collection of Pahari miniature paintings depicting scenes from palace life and rural scenes. The presiding deity of the valley is manifest in the small idol of Lord Raghunath housed in a temple within the Kullu palace complex. Folklore holds that the idol was brought from Ayodhya by a former Kullu king to dispel a curse on the royal family. Leading a grand procession on a wooden chariot pulled by devotees, Lord Raghunath rides into Dhalpur ground with deities in attendance to mark of the week long Dussehra festival every year. It is a grand spectacle with over 200 village deities carried around in palanquins. After paying reverence to Lord Raghunath they participate in the festivities that follows. For the festival, held in autumn, several stalls are laid out that sell a variety of local wares. In the evenings cultural performances are held at an open theatre where international troupe shows are held alongside those put up by local artists. The pyramidal-style, stone monolithic temple dedicated to Lord Shiva, locally addressed as Basheshara, at Bajura is dated to have been built sometime between 9th and 12th century AD. The temple embraces the ancient Shankaracharya’s Panch Dev Puja Paddhati wherein five Gods are worshipped at one place. The excellent workmanship of the large bas-reliefs and other sculptural decoration besides the scenic location on the bank of River Beas, and in close proximity to the highway does draw a large number tourists to this temple. It is a week long international level fair held every year during October. The International Kullu Dussehra fair is scheduled to be held in October, 2014 at Kullu. The major attraction of the fair was the assembly of hundreds of local deities with the main deity Raghunath ji. Other activities like cultural programmes, exhibitions were also organized. Everything on the fully vegetarian and non-vegetarian menu is readily available in Kullu restaurants. Besides the regular Indian and continental cuisine, Italian and Chinese food options are also available. Some eateries do offer Himachali specialities also. Kullu has good healthcare facilities. There is a district level allopathic hospital, an Ayurvedic hospital, a government homeopathic centre and many private clinics in the town. Kullu is well connected by road. The destinations of Manali, Shimla, Delhi and Chandigarh can be reached by public or private transport services. Cabs and busses are easily accessible. Summer is a good time to visit Kullu for people wishing to escape the scorching heat. To glimpse the valleys unique culture, autumn when the valley celebrates Dussehra is a good time to be around. For those who enjoy the magic of a snowfall, winter is good time to be in Kullu valley. December to February is generally the chilliest period when chances of witnessing a snowfall are more. Standard access to high-speed internet along with strong setup of all national mobile network carriers is available. Enclosed on three sides by the Greater Himalaya ranges, this national park supports a diverse set of wildlife and is one of the best destinations for western Himalayan flora and fauna lovers. 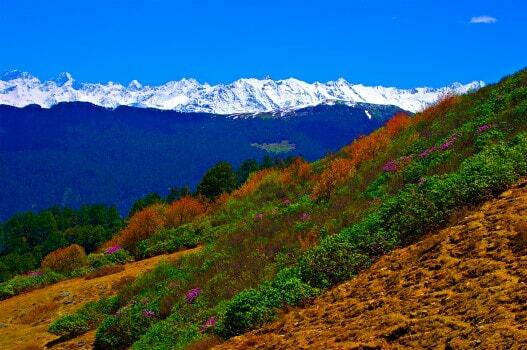 Home to the rare and endangered Himalayan Thar, Himalayan Brown Bear, Snow Leopard and Blue Sheep, the park is a refuge to Western Tragopan, Monal and other rare birds also. Spanning an area of over 1000 square kilometers with an altitudinal variation from 1300 to over and 6000 meters, alpine pastures and glaciers are a source of awe and inspiration for trekkers, wildlife enthusiasts and birders. The rivers of Parvati, Tirthan and the stream of Jiwa Nallah originate from within the park. It is a UNESCO World Heritage Site and there are no roads or paved trails in this carefully conserved natural habitat. 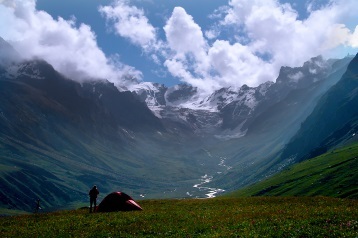 This vast wilderness is only for those who love trekking and outdoor camping. A pilgrimage place for Hindus and Sikhs, this very scenic locale on the banks of River Parvati has temples revering Lord Ram, Krishna and Shiva and other Hindu deities. 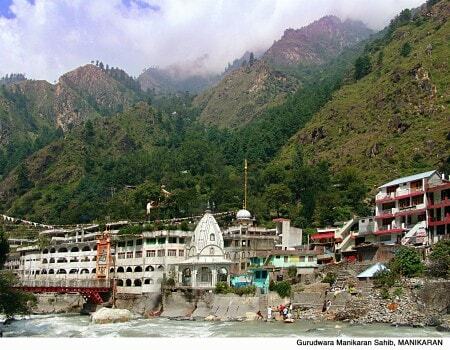 Manikaran even attracted Guru Nanak, the founder of the Sikh faith, during his wanderings in the Himalayas. A gurdwara commemorates the visit. Hot sulphur springs bubbling near the icy waters of the river are therapeutic and sacred. Buses are easily available to Manikaran from Kullu and cabs can also be hired. Stretching along the banks of River Parvati, Kasol is a popular hub for domestic and foreign tourists.. Once a quaint village that is now divided by a bridge into old and new townships has only recently expanded to have growing number of guesthouses, camps and hotels to meet the increasing demand of vacationer visiting the place. Buses regularly ply to Kasol and taxis are also easily available for hire. A wind swept commanding pass, Jalori demarcates the catchments of River Satluj from Beas. 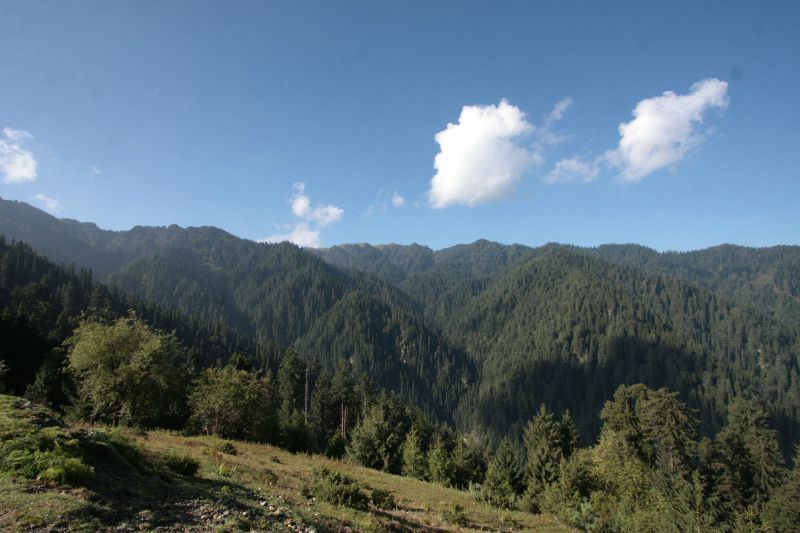 The panoramic view captures snow clad Himalayan ranges in the distance, deep forests of the Great Himalayan National Park and the river valleys on both sides of the ridgeline. The chill in the air at Jalori makes for great trekking country. A day hike to Serolsar Lake is a memorable trail to tread upon. Several buses cross the pass regularly during the summer months. In winters the pass receives a lot of snow and remains closed for traffic from December to March. Scattered wilderness, meditative silence and the sheer raw beauty of Shoja quenches the desire for a quiet mountain holiday. Aesthetically built houses set among apple orchards with wide view of the valley have travellers revisit the place year on year. Shoja is also the base for easy treks to Jalori Pass, Serolsar Lake, Takrasi and Khanag. This quaint hamlet is slightly off the main road from the Kullu-Ani road that goes over Jalori Pass. Public and private operators do run regular buses on the route. Taxis are also available. Angling is the joyous sport of matching your fishing skills with the agility of a fish by first making a catch of one and then releasing it back into the waters. The clear waters of the snow fed River Tirthan hold a lot of trout fish. To test your fishing finesse, angling along the river stretches near Banjar is a fun filled adventure to participate in.